2 – Master Coach MaryAnne’s Mom (and inspiring SCULPTAFIT client), Susan, officially joins the Team as a Support Coach and Emergency Super-Sub. This lady is AMAZING and inspiring. Her history makes you say “WOW”. Honored to have her on board. 3 – 12 months ago we technically started with “zero” clients and we are soon going to break over the “100 client” level. And we will be cruising toward at least 200 clients by this same time next year. This all happens “one woman at a time”. 4 – Why we do what we do (for women like you). Our unique and special place in the universe. And the mission we are on to bring “real women” what they have been lacking, and needing, in their lives in order for them to take proper care of their mind, body and spirits. And if you’re in any of the following areas; Saint Johns, Fruit Cove or Mandarin, Florida – you owe it to yourself to come try a few sessions, ON US…. so you can see that your best potential, and life, can still be lived! It’s never too late, and you deserve the BEST version of yourself. 1 – How his own life challenges and disappointments forced him to invent an easier, more enjoyable way to stay in awesome shape and healthy. 2 – Why his friends, family and clients kept pushing him to do something with this unique fitness invention he created for himself and his kids (at first). 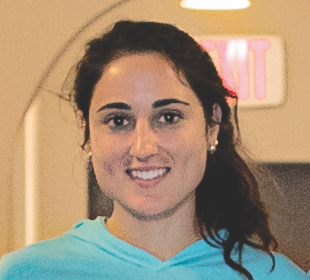 3 – The reasons for opening the first SCULPTAFIT Studio for Women in Saint Johns & Mandarin area of Florida. There is more revealed in this interview that will open your eyes to your own potential and how you can make positive health and fitness improvements starting today and lasting for a LIFETIME. After the Team designs the configuration, Master Coach MaryAnne meets with Joey for a walk-through/talk-through review, for any final tweaks or adjustments. The video above is a “behind the scenes” look at one of these walk-through/talk-through sessions…. Nikki (Director of Smooth Operations) let the candid camera roll and caught it all on video. After watching the video, we thought it would be a good idea to share it today to give you a better idea of the careful planning that goes into our gentle, safe, fun and wildly effective method we guide women through on a daily basis. It’s Friday, almost the end of the first Official Week in Operation of the brand new SCULPTAFIT Studio for Women here in Saint Johns/South Mandarin… And boy do we have a LOT to share with you. 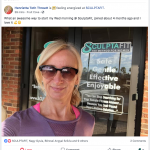 1 – Our first group of “eager and ready” women have set the tone for what SCULPTAFIT is all about and exactly “who” it is for. 2 – New friendships are being made and horizons are expanding. …A place where each woman can relax, be herself and focus on what is most important to her, her health and well-being – fully KNOWING that everyone else in the room is not only there for herself – but also to support each other… Very powerful – and very special to see. 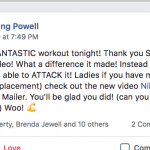 We hope you at least give yourself the chance to experience what is happening here and maybe even become part of this positive, empowering and unique community of women who are living life to the fullest, on a solid foundation of optimal health and proper fitness. >> Want to stop your downward spiral into poor health? >> Want to get out of the personal “nowhere land” you feel you’re floating around in? >> Want to achieve your best version of you – for yourself and your loved ones? Crazy to think I might not be allowed in the place I created! LOL… Ah well – all good! !